Crema Pacific Grove | Crema’s Chicken & Waffles recognized as “Best Use of Culinary Time”! Crema’s Chicken & Waffles recognized as “Best Use of Culinary Time”! 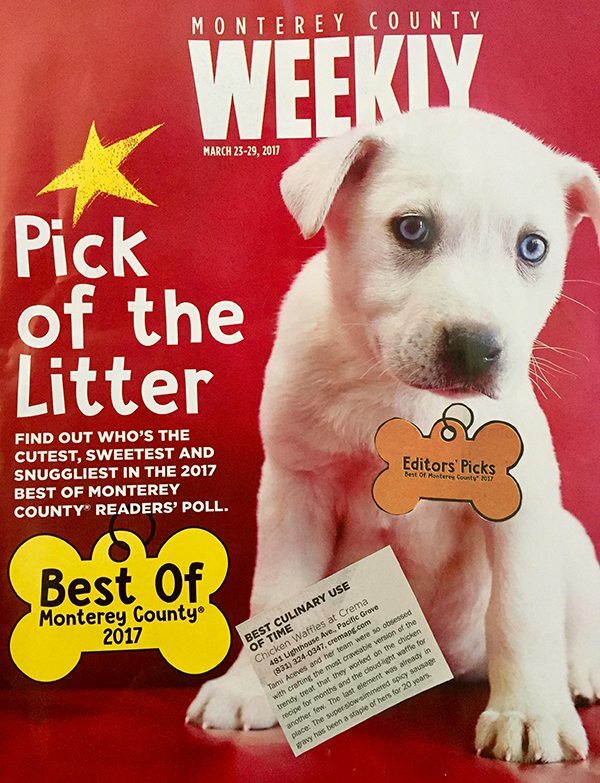 Thank you to the Monterey County Weekly for selecting us as an Editors’ Pick Winner in this year’s Best Of special edition! Proud to have our Chicken & Waffles recognized as “Best Use of Culinary Time”! Tamie Aceves and her team were so obsessed with crafting the most craveable version of the trendy treat that they worked on the chicken recipe for months and the cloud-light waffle for another few. The last element was already in place: The super-slow-simmered spicy sausage gravy has been a staple of hers for 20 years.